The Benromach Distillery was closed and mothballed in late 1983. Gordon & MacPhail purchased the distillery in the early 90s and it was in full production again in 1998. 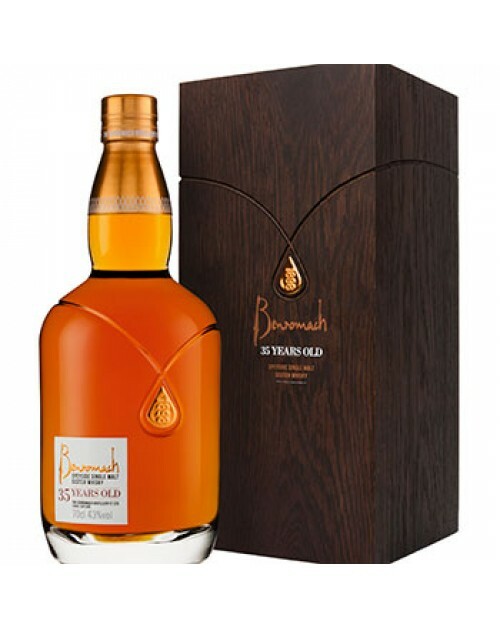 This 35 year old single malt expression was distilled prior to the cessation of production. The very smart packaging pays homage to the original dark grained wooden wash-backs as well as the stills and delightful lime-washed distillery walls. Nose: Plenty going on here; vanilla, burnt oak, peach and butterscotch. Palate: Red apples, a touch of cocoa; fragrant and fruity. Finish: Long - oak, cinnamon sticks and vanilla.